Authored by epriestley on Feb 11 2019, 5:38 PM. Ref T13250. When exceptions occur in display/rendering/writing, they currently go straight to the fallback handler. This is a minimal handler which doesn't show a stack trace or include any debugging details. In some cases, we have to do this: some of these exceptions prevent us from building a normal page. For example, if the menu bar has a hard fatal in it, we aren't going to be able to build a nice exception page with a menu bar no matter how hard we try. However, in many cases the error is mundane: something detected something invalid and raised an exception during rendering. In these cases there's no problem with the page chrome or the rendering pathway itself, just with rendering the page data. 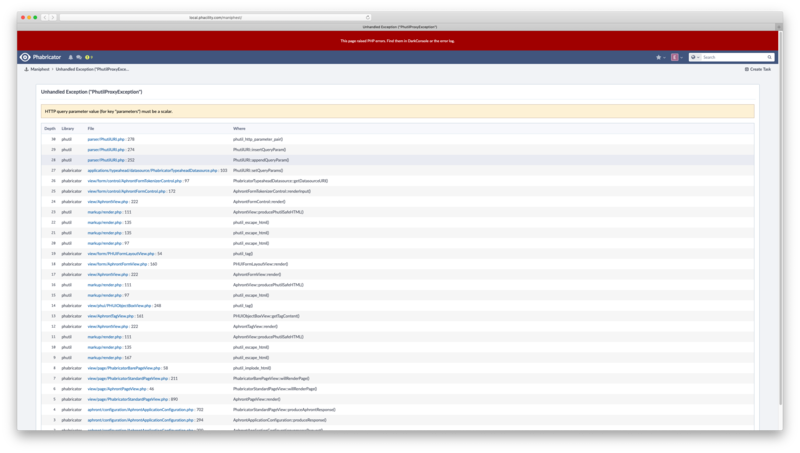 When we get a rendering/response exception, try a second time to build a nice normal exception page. This will often work. If it doesn't work, fall back as before. Forced the error from T13250 by applying D20136 but not D20134.